I’ve really been digging JellyBean on my Galaxy S2, but the battery life has been a dagger. With my previous Gingerbread ROM, I was easily getting about 1.5-2 days of normal-use on a single charge. Since upgrading to CyanogenMod 10 (Beta 2), I’ve only been getting 8-10 hours, and most of that is standby! I’m never away from a convenient charging location for more than a few hours, so this is more of an annoyance than a deal-breaker, but I’d still like to get it fixed. I thought that maybe the battery drain had to do with CM10, so I switched to AOKP over the weekend. The good news is that I like it just as much as CM10, but I didn’t really see any improvement in battery life. Using the standard battery details in Android settings, I was able to see that the vast majority of my battery—70 to 80%–was being used by Android OS, but that’s as much detail as you get. That’s not very helpful, and so I turned to BetterBatteryStats. Looking at the screenshots, I wasn’t sure how useful the app was going to be. It was also $3, which is pricey fare for the app store. The app was recommended on many-a-forum, though, and I decided to take the plunge. I’m happy I did. 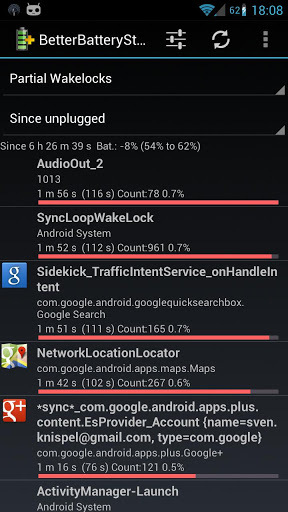 It’s easy to see what’s eating up your battery by looking at the Partial Wakelocks. Right away, I could see that NetworkLocationService was a major culprit. After just a few minutes of googling, I found that this service was linked to the Wi-Fi & Mobile network location setting in Settings > Location Access. I had originally linked this setting just to wi-fi. I knew I should keep wi-fi turned off when I wasn’t using it to conserve battery life, and I (incorrectly) assumed that the location service would be disabled-by-proxy when wi-fi was off. Upon re-reading the setting, it was using mobile data to update my location. Battery life is a much bigger priority to me than location-based services, so I turned off the setting and improved battery life significantly. A few hours later, I decided to check the battery stats again. This time, it was the GPS. Like wi-fi, I knew that I was supposed to keep GPS turned off to conserve battery life. I got tricked by the fact that the GPS icon in the status bar was only visible for certain apps, though. I turned it off and boom–more battery life. If you’re experiencing battery woes, I’d give BetterBatteryStats a look. It was well worth the $3 investment for me. In a day of monitoring and tweaking, I’ve gone from under 10 hours to over 20.